Love implies boundaries. There is no tradeoff between love and discipline. Discipline is an expression of love. Love is incomplete without discipline. Our kids need to know that we are for them, the way Jesus is: embracing them as they are no matter what, but also helping them to change and grow. If Christ is at the centre, prayer and bible reading will be part of the rhythm of family life. Jesus is not at the centre of our family if we don’t ever speak to him, or let him speak to us. If he is, your children will hear their parents pray for them, and pray with them. They will see their parents opening the bible for a word from God. Prayer and bible reading will be as natural as making toast or hanging out the washing. If it is, it models the kind of dependence that says “this family could not function without Jesus”. Kids don’t like to get caught by their parents, but parents should be hoping against hope to get caught by their kids. When your kids “catch” you reading the bible, or praying, or talking about Jesus outside of the formal routine it is an incredibly powerful witness. Nothing says “this is real” like catching dad on his knees at the end of the bed, or overhearing mom gospel a friend on the phone. The old adage might just be true in this case: more is caught than is taught. This mark is close to the previous one. The formal routine is the daily bread of Christian parenting, but the unplanned “event” is the gourmet meal. The conversation on the way to the hardware shop; the hard question after prayers at bedtime; the punch-up at school that opens a window into the heart for the gospel to shine – this stuff is potent. The routine, the rhythm and life together put you in a place to take these gaps as Christian parents. You need to be ready to take them. If you think you are not going to fail occasionally as a parent, then I’m not sure Christ is at the centre… If he is, he’s calling you to model Christian failure to your kids. A big part of that is saying you are sorry. If Christ is at the centre, you are free to humble yourself and apologise to your children. If you mean it, you would have already said it to God. If you mean it, it will come with a heartfelt desire to turn away from the sin that brought about the apology, in the power of the Spirit. Having Christ in the centre. 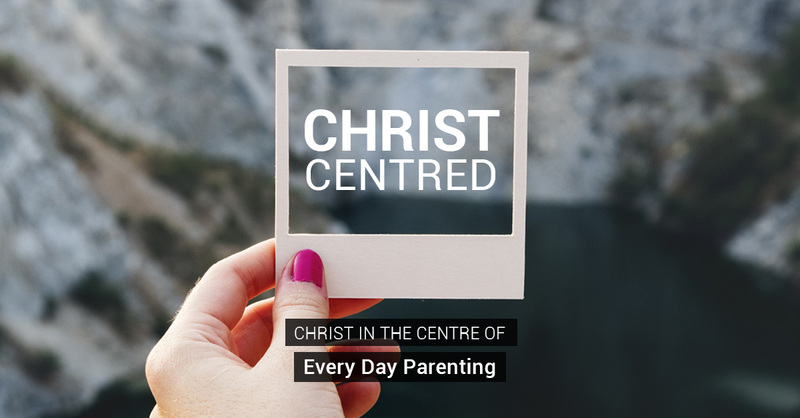 Parenting with Christ in the centre only works if Christ is in the centre. Your centre. If he isn’t, nothing will be more harmful to your children than pretending he is. Religion or moralism dressed up as Christian parenting will poison your children off the gospel. Rather buy a Dr Phil book and go with that. Or infinitely better, why not invite Christ into the centre?